NEW AGENTS- Our platform is perfect for newly licensed agents or agents currently in school. They are able to search and compare companies to find the best fit for them. But they are not only looking for the right real estate company to work for, they are also in need of establishing relationships with lenders, title reps, vendors, etc. Our partnership with Kaplan Real Estate Education creates site traffic. Kaplan alone graduated over 300,000 students last year. 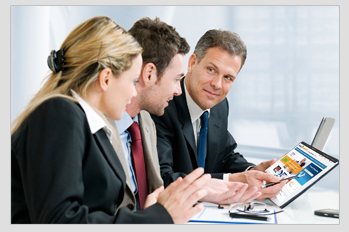 EXISTING AGENTS- There is over 1.9 million real estate agents nationwide, and growing. We have access to these agents through an opt-in email marketing service, and drive traffic to our site. Agents are entrepreneurs, and are always looking for opportunity. Our site content is “sticky” and causes curiosity. TOP AGENTS- Top agents move around too. Our site provides anonymity when searching for potential real estate opportunities. They feel comfortable browsing RealtyConnection. With our strategically, yet tastefully placed banner ads, your company can be introduced to these mega producers. EXECUTIVES/DECISION MAKERS- Our clients are typically Broker/Owners, Managing Brokers, Marketing Directors, Directors of Business Development, etc. They are generally “decision makers”. The number of internet users is on a rapid rise worldwide and the internet is being used by people of all age and types. Internet has become one of the major medium for communication, entertainment and is indeed in the process of replacing traditional entertainment, promo products, and informative medias. Internet has also undoubtedly become a major and effective medium for advertising and it can clearly be predicted that the online advertising and marketing is very soon going to replace the advertising through traditional medias such as television, radio, newspaper and magazines. We offer both horizontal and square banner ads on our HOME PAGE!!!. 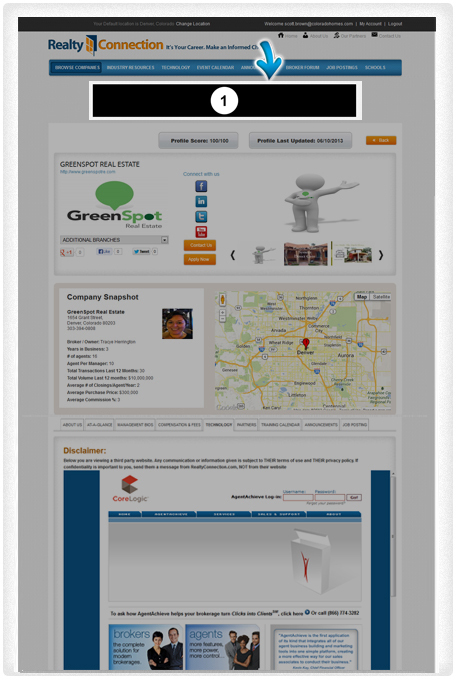 The horizontal banner is above the fold, in the scrolling bar with real estate company logos. This has proven to be appealing to the eye, and logos are clicked on directly from this location. 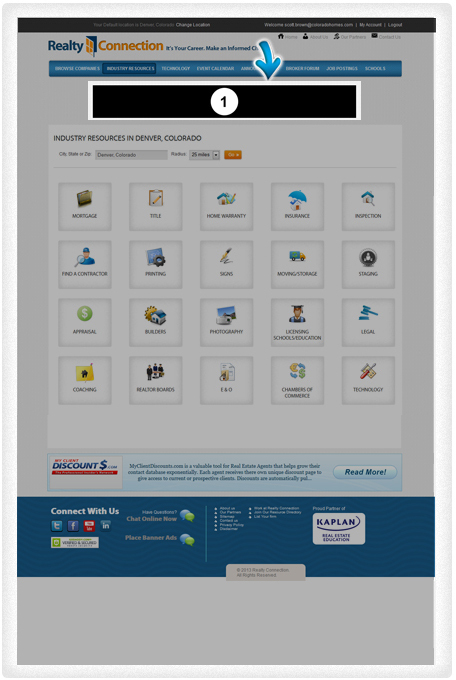 Our square banner ads are located on the right side of the home page. Home Page advertising is very limited, and we offer exclusivity within your industry, so do not hesitate. Thousands of Real Estate Agents move their license every month. 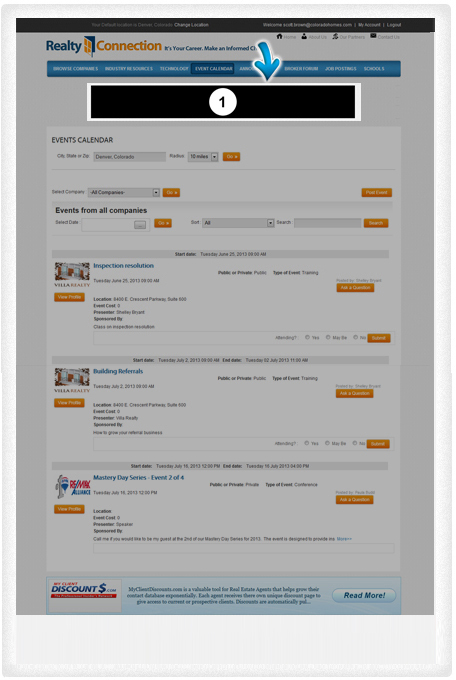 Our Company Search aggregates company data to make it easy to get information on company models and commission splits. Whether just browsing or actively searching, our Company Search is very popular and very active. Placing your Advertisement on the Company Search Results page puts your company information in prime position for the most exposure on our on our site. Every time a Realtor searches companies, whether one or multiple, your Ad will appear front and center for maximum visibility! 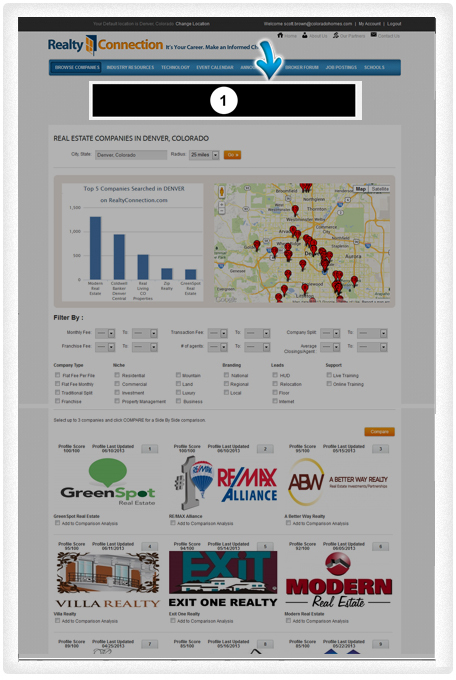 Company Profiles are the most common destination for agents on our site. They come to Realty Connection looking for information on companies. We put your banner ad front and center, above the profile and above the fold for maximum visibility. 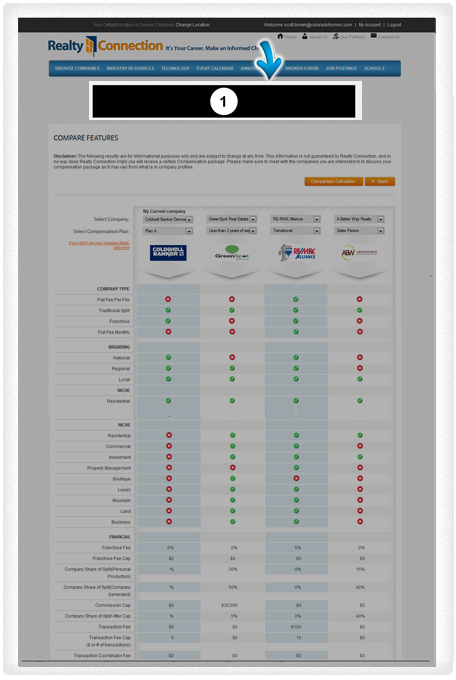 The Compare Features Page is a very popular destination for agents on our site. They select multiple companies and conduct a side by side analysis. Because there is a lot of information to be analyzed in a side by side format on this page, agents spend A LOT of time on this page. 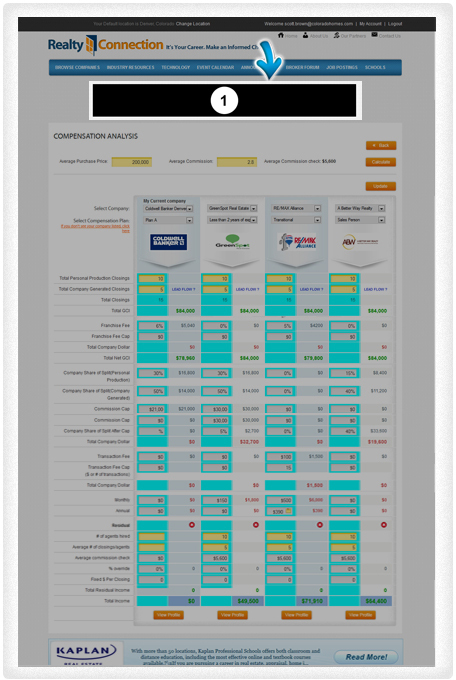 This Comparison Calculator is one of a kind, and very interactive. Agents can play with different compensation plans, production levels, etc. What does this mean for you? Agents spend a lot of time crunching numbers to see where they might make more money. 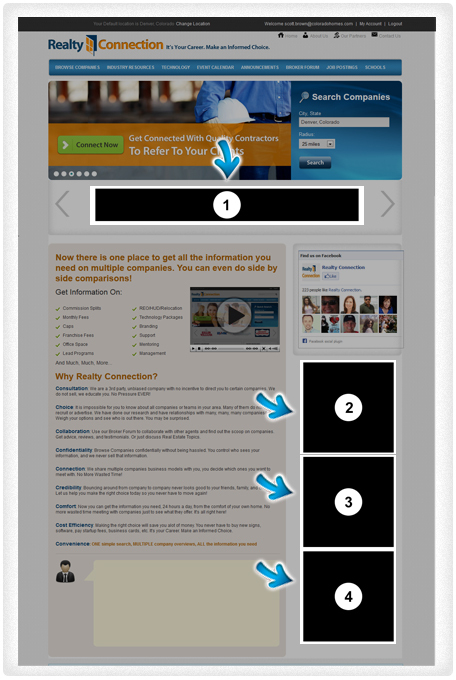 Your Banner is front and center above the fold, on top of the page, very visible to the eye. The Industry Resources Page is simply a directory for agents to find contact information, reviews, etc for companies related to the real estate industry. Your horizontal banner appears on the Main page, as well as in over 20 subpages. 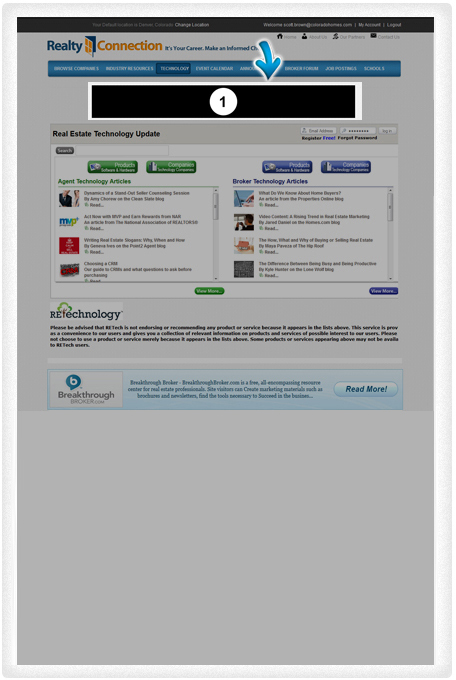 The Technology tab allows agents to find technology products to enhance their business. 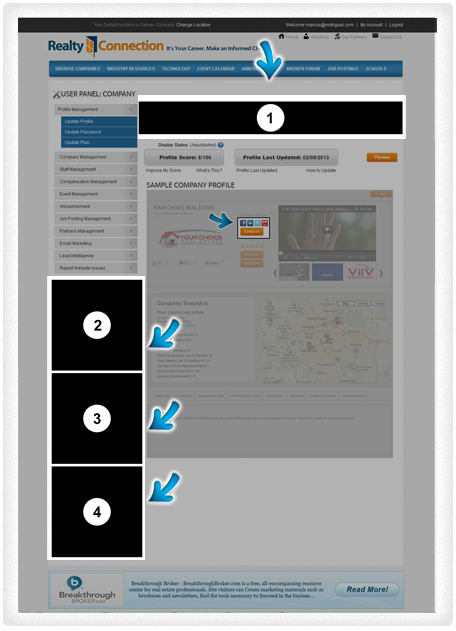 Agents coming to this tab are looking for solutions to take them to the next level. If you have a tech product that can be useful for agents, this is the place for your banner ad. The Event pages aggregate training and social events, announcements, and job postings from real estate companies, title companies, mortgage companies, etc. Agents come to these pages looking for education, or ways to network with others in the industry. Your banner is on the top of the page, above the fold. Top of the page = Top of Mind Awareness! 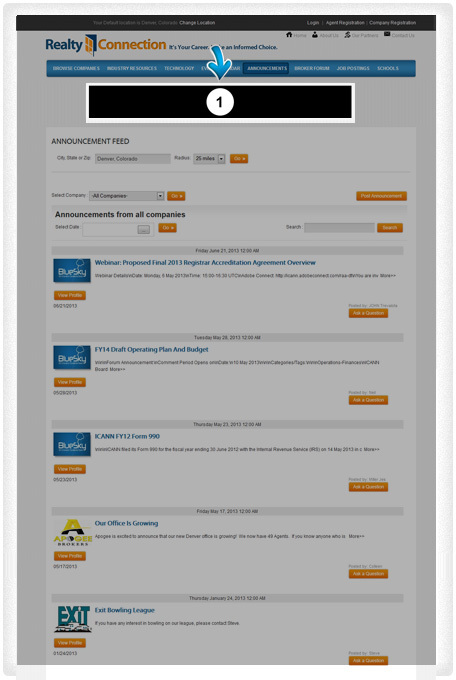 The Announcement pages aggregate training and social events, announcements, and job postings from real estate companies, title companies, mortgage companies, etc. Agents come to these pages looking for education, or ways to network with others in the industry. Your banner is on the top of the page, above the fold. Top of the page = Top of Mind Awareness! Agents coming to our site are looking for solutions to help with their business. They create an account for FREE and are able to browse and compare real estate companies side by side, and find other valuable resources to help with their business. We offer 4 banners within their admin panel, where they spend a lot of time and manage the relationships and conversations with Managing Brokers. 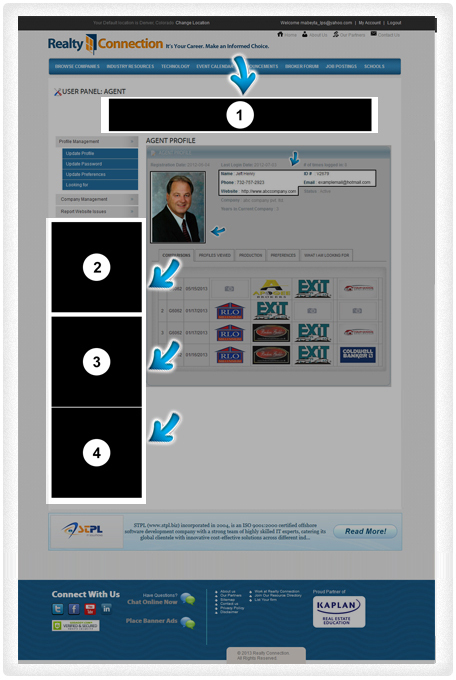 You can access these agents often through a horizontal ad or a square ad along the left side. If decision makers are your target, then this is where you NEED to be. The person logged into these admin panels are typically Broker/Owners, Marketing Directors, Recruiters, Managing Brokers, etc. 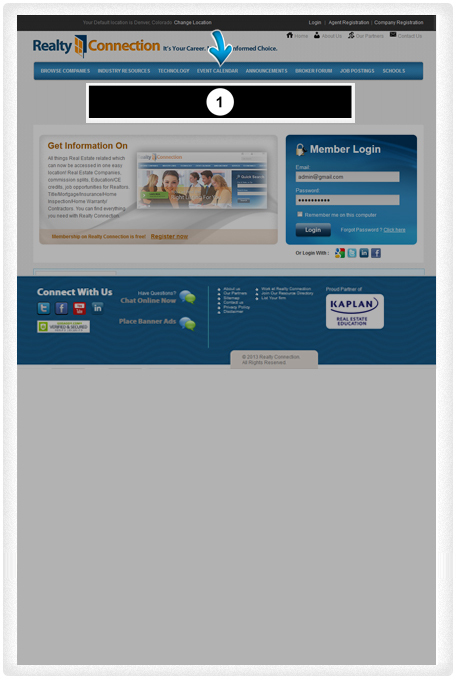 They login often because this is where they communicate with potential recruits. We have horizontal ads on the top of the page above the fold, and 3 left sided square banners. All contain exclusivity within your industry, so act now! This is when an agent has logged out of our site. They are looking for their next destination. That destination could be your site. We put your banner in an eye-catching, top of page location, ready to be clicked. Agents always are looking for qualified contractors they can refer to their clients. 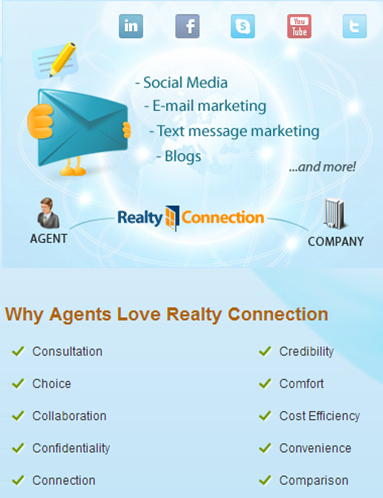 Realty Connection allows agents to quickly find pre-screened contractors for any job. 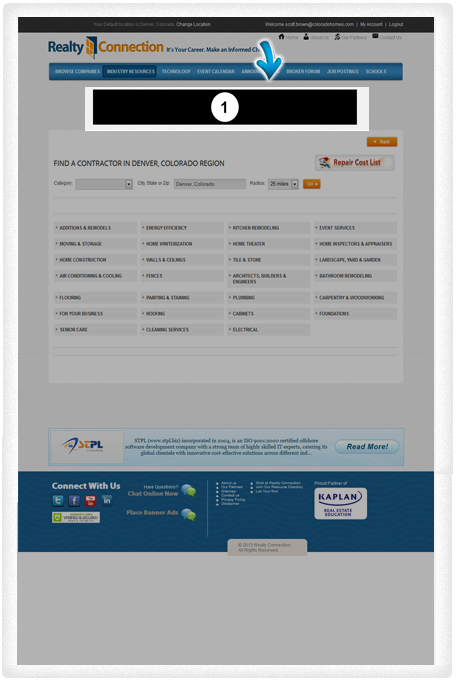 The average buyer or seller asks for between 7 and 10 referrals at some point, and we have a nice, aggregated directory of top contractors in their location. We put your banner ad on the top of the main page, as well as on top of over 30 subpages for maximum exposure. 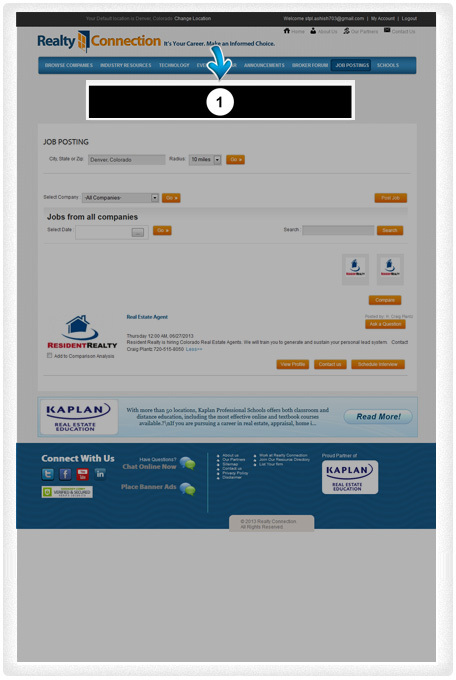 The Job Posting pages aggregate training and social events, announcements, and job postings from real estate companies, title companies, mortgage companies, etc. Agents come to these pages looking for education, or ways to network with others in the industry. Your banner is on the top of the page, above the fold. Top of the page = Top of Mind Awareness!